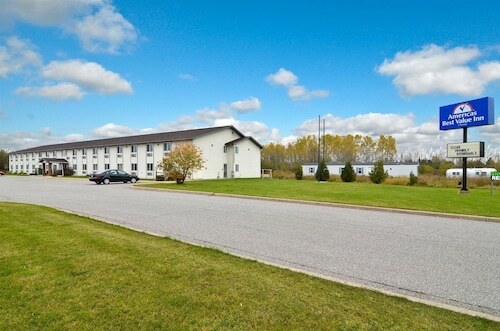 Located in Algoma District, this hotel is within 3 mi (5 km) of Water Street Historic Block, Pullar Stadium, and Crossings at Sault Ste Marie Golf Course. Museum Ship Valley Camp and History Tower are also within 3 mi (5 km). Located in Algoma District, this hotel is within 3 mi (5 km) of Lake Superior State University, Soo Theatre, and River of History Museum. Water Street Historic Block and Soo Locks are also within 3 mi (5 km). Located in Algoma District, this property is within 3 mi (5 km) of Lake Superior State University, Soo Theatre, and River of History Museum. Water Street Historic Block and Soo Locks are also within 3 mi (5 km). Located in Algoma District, this hotel is within 3 mi (5 km) of Lake Superior State University, Tanglewood Marsh Golf Course, and Soo Theatre. River of History Museum is 2.9 mi (4.7 km) away. 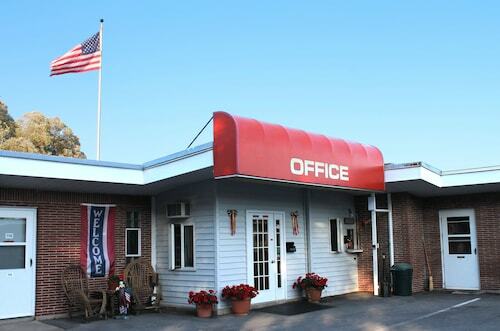 Located in Algoma District, this motel is within a 15-minute walk of Soo Theatre, River of History Museum, and Lake Superior State University. Water Street Historic Block and Soo Locks are also within 1 mi (2 km). How Much is a Hotel Room in Sault Ste. Marie? 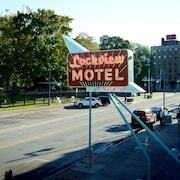 Hotels in Sault Ste. Marie start at $56 per night. Prices and availability subject to change. Additional terms may apply. 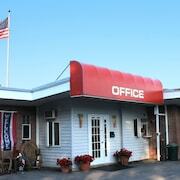 If you are researching a vacation in Upper Peninsula and seeking the right place to rest and relax in Sault Ste. Marie, you'll discover an extensive range of options to weigh up. Travelocity currently features 10 places to put your feet up within a short drive of Sault Ste. Marie. Found within a short drive of Sault Ste. Marie, are the Holiday Inn Express Sault Ste. Marie and Hampton Inn Sault Ste Marie. Investigate the Delta Hotels by Marriott Sault Ste. Marie Waterfront and the Algoma's Water Tower Inn & Suites. The Delta Hotels by Marriott Sault Ste. Marie Waterfront is located only 7 miles (12 kilometers) away from the center of Sault Ste. Marie. 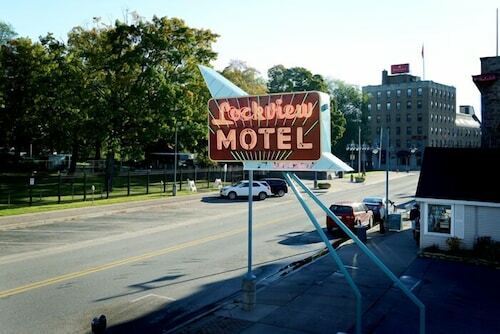 The Algoma's Water Tower Inn & Suites, is located 9 miles (14 kilometers) away. 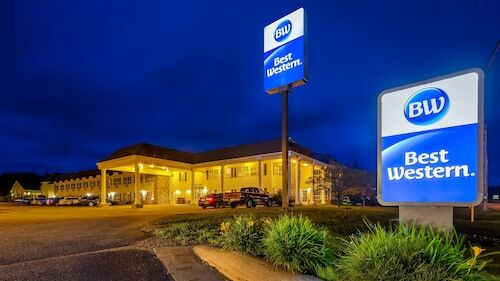 Other places to stay worth checking out include the Holiday Inn Express Sault Ste Marie as well as the Quattro Suites & Conf. Centre, an Ascend Hotel Collection M..
Would you like to move out of the center? Upper Peninsula is home to many exciting attractions worth seeing. Learn about Upper Peninsula's lighthouses. Those who love the great outdoors could also make the time to relish the region's forests and lakes. Popular things to do in this corner of United States of America include snowboarding. There are a variety of hotels and apartments in Water Street Historic Block, which is positioned 7 miles (10 kilometers) to the north of Sault Ste. Marie. 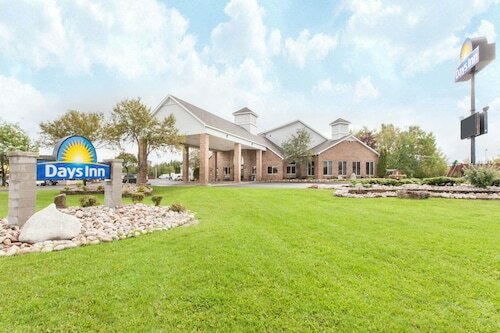 The Comfort Inn Sault Ste. Marie - Canada and Quality Inn & Suites Bay Front are some of the Travelocity-registered establishments here. Consider spending an afternoon enjoying thrills and spills with fellow spectators at a local game. You can find Pullar Stadium 6 miles (10 kilometers) to the north of Sault Ste. Marie. 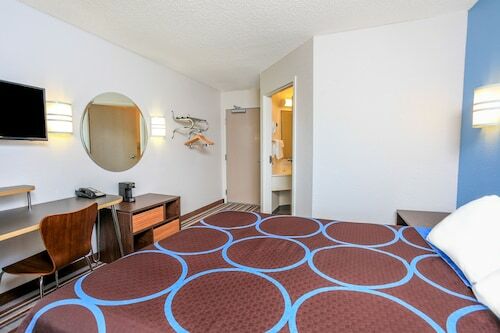 Book a Travelocity-listed hotel close to the sporting action at the Ramada Plaza Sault Ste. 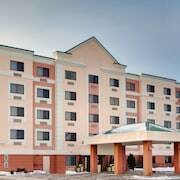 Marie Ojibway or the Days Inn & Suites Sault Ste. Marie, ON. Why not check out our enlightening Sault Ste. Marie city page and unveil the numerous attractions this part of the world offers. Liked seeing the locks from the hotel window. Only thing missing would be a microwave. Clean and well maintained. They are pet friendly which makes it sometimes difficult but our stay was super pleasant. No refridgerators in room, have to pay extra to get one brought into the room. Not enough electrical outlets, had to unplug lamp in order to plug in CPAP machine and fridge. 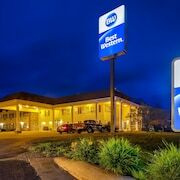 Very clean; staff was courteous and helpful. Lots of choices for breakfast and if you select foods carefully it can be nutritious. Tastefully Decorated And Sparkling Clean ~ Home Away From Home! Cozy And Sparkling Clean ~ Better Than A Hotel! Sugar Island-waterfront Property With Pontoon . Open all Year! Pine Place Vacation Rental, Come Experience 'Up North' on Sugar Island! Ranch Style, Waterfront Property! Great for Boat Watchers. Freighters Galore! Cozy two Bedroom Walkout Overlooking Lake Superior's Beautiful Whitefish Bay! Beautiful Cottage on St. Martins Bay, Lake Huron, With Pontoon, Kayaks & Canoe! Barbeau Log Cabin W/pool Table & River Views! Lakefront Property, 15 Miles North of St. Ignace and 15 Miles East of Hessel!